Sauerkraut is finely cut, fresh cabbage that has been fermented with several types of lactic acid bacteria. Eaten alone or used to flavor hot dogs, casseroles and meat dishes, sauerkraut is also a nutritious food that dogs can eat safely. Since most dogs won’t eat sauerkraut by itself, creative dog owners have found ways to incorporate sauerkraut into their pet’s food so strong smell and taste doesn’t bother a dog’s sensitive nose and palate. All warm-blood animals need iron to boost energy, regulate metabolism and support blood circulation. Without enough iron, a dog’s organs may not receive enough oxygen to function normally. Lack of iron can also cause mental slowness and tiredness in dogs with anemia. Because sauerkraut undergoes the process of fermentation, dogs given sauerkraut receive “good” bacteria (probiotics) that helps improve and maintain gut health. Fiber-rich sauerkraut also prevents constipation, bloating and flatulence. By improving enzymatic activity in the gut, sauerkraut may also reduce a dog’s risk for suffering gastric ulcers and chronic diarrhea attributed to irritable bowel syndrome (IBS). Lacto-fermented sauerkraut contains rich amounts of probiotics that help lower cholesterol levels in older, heavier dogs. In addition, these good bacteria interfere with fat absorption to assist overweight dogs in losing weight and improving heart health. Vitamin A and carotene in sauerkraut act as antioxidants to enhance a dog’s eye health and reduce the risk of cataract formation in older dogs. Vitamin A especially contributes to tissue growth. 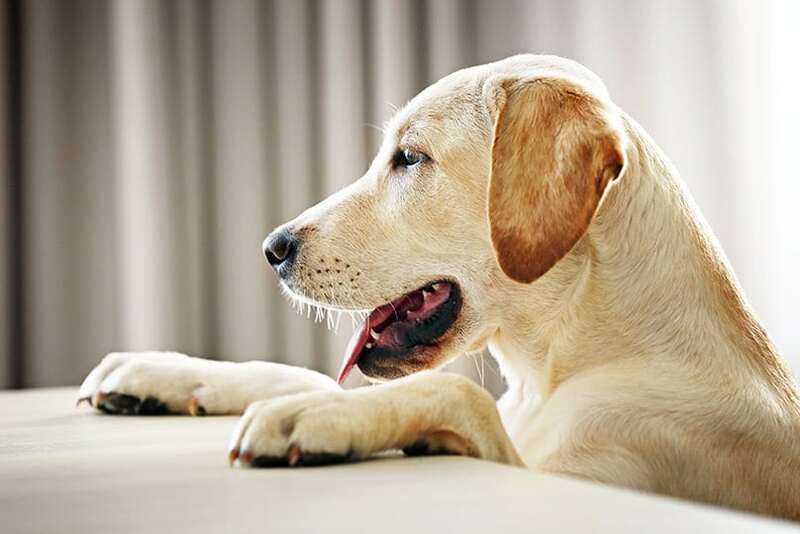 Dogs with itchy, dry skin and dull coats may have a vitamin A deficiency. One cup of sauerkraut provides dogs with plenty of vitamin C necessary for supporting their immune system. Vitamin C promotes white blood cell production and stimulates cellular regeneration. Collagen formation needed for healthy development and growth of organs, muscles, blood vessels and bones is another benefit of vitamin C found in sauerkraut. Phytonutrients in sauerkraut (and other leafy vegetables) act as anti-inflammatory antioxidants that may reduce muscle and joint pain in dogs with arthritis or other musculoskeletal problems. 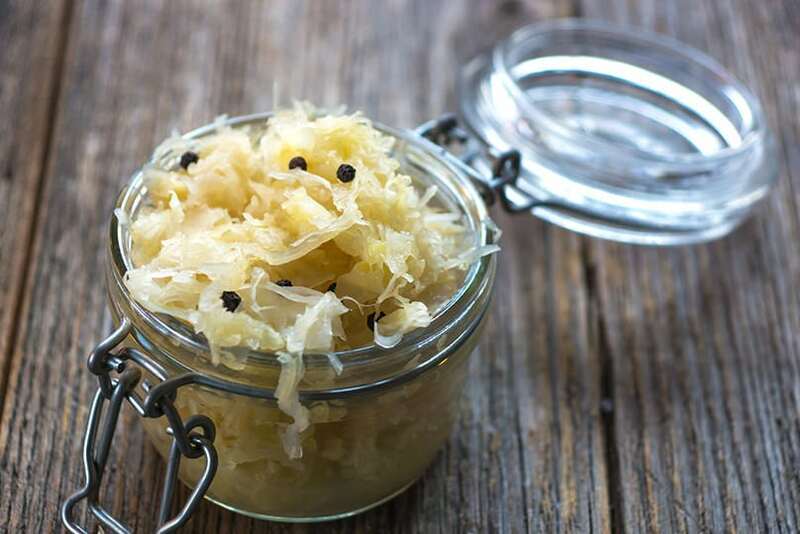 Sauerkraut probiotics also provide anti-inflammatory attributes that can help improve allergies, reduce incidences of infection and support a dog’s overall health and well-being. Minerals in sauerkraut are ideal for developing strong bones in puppies and maintaining bone health in adult dogs. Vitamin K2 supports other minerals that help maintain a dog’s bone integrity and ability to remineralize as dogs mature. While sauerkraut offers numerous health benefits for dogs, it is high in sodium. If your dog has been diagnosed with a kidney or cardiovascular disorder, talk with your veterinarian before adding sauerkraut to your dog’s diet. What are Sauerkraut Probiotics and How Do They Improve a Dog’s Health? Probiotic bacteria form colonies of good bacteria inside the canine gut to help protect dogs against a variety of gastrointestinal diseases such as digestive tract inflammation and canine gastroenteritis. Fresh sauerkraut contains over a dozen strains of good bacteria that restore the balance of good and “bad” bacteria in the canine gut. When there are too many bad bacteria, dogs can suffer recurring infections, diarrhea, skin irritations and even depression. Helps preserve canine eye health by providing two antioxidants–zeaxanthin and lutein–that support tissue and blood vessel development while protecting against cataracts. While sauerkraut is a wonderfully nutritional food to give to dogs to restore and support gut health in dogs, most dog owners are probably wondering–how in the world to you get a dog to eat sauerkraut? To start getting your dog used to sauerkraut, chop some up into tiny pieces and mix about one tablespoon in a can of wet dog food. You might also add a small portion of sardines or other smelly fish to make the food more palatable. Be aware that some dogs will simply not eat vegetables, no matter how hard you try and conceal them in regular dog food. Sometimes, weakening the strong smell and taste of sauerkraut can encourage dogs to eat food mixed with sauerkraut. Try draining sauerkraut with a colander and rinsing the sauerkraut with cold water. You could also put sauerkraut in a bowl, cover the kraut with apple juice or water and soak it for about 30 minutes to reduce sauerkraut’s powerful smell and flavor. Another way to encourage dogs to eat sauerkraut is to cook it with sliced apples to make sauerkraut mellower and sweeter. Since sauerkraut has already been fermented, cooking sauerkraut won’t reduce the amount vitamins, minerals and probiotics it offers to enhance your dog’s health. MY DOG ATE 30 OZ OF SAUERKRAUT TONIGHT. HE IS ALMOST 3 YEARS OLD, IN PERFECT HEALTH. WHAT MIGHT HAPPEN TO HIM?